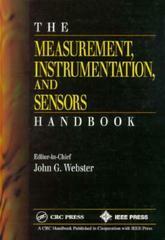 The Measurement, Instrumentation and Sensors Handbook provides a graded level of difficulty from start to finish, serving the reference needs of the broadest group of readers. Edited by one of the more noted instrumentation experts in the world, the book contains nearly 150 contributions, covering all aspects on the design and implementation of various instrumentation. With 14 chapters filled with a wealth of useful information, this comprehensive reference will be a valuable addition to anyone who works with instrumentation and measurements."